“The Beach House” was always a magical place for me, my brothers and our nieces and nephews. On the windy dunes north of Lincoln City, Oregon, well before there were many houses there, and near what is now Roads End State Park, we ran wild (outdoors where the grownups wanted us!) through the dunes on our family outings. The line we couldn’t cross when it was just the kids playing, however, was the trail down to the beach where we were told there were “sneaker waves”. 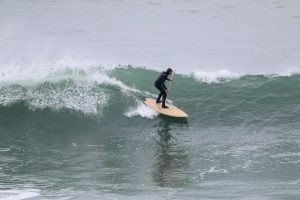 I never quite figured out what those sneaker waves were all about until I got serious about spending time in and on the ocean. I just heard the stories that my grandmother and great grandmother used to tell to scare us kids into not going onto the beach without an adult. As a surfer and sailor with decades of time spent around the marine environment, conditions regarding Mother Ocean have become much clearer. Sneaker waves can be seriously deadly if you aren’t playing by the rules Mother Ocean lays down. I’ve spent a great deal of time trying to understand those “rules” and how to work with the ocean and the other aquatic environs. The beach house was my window to a world I could only imagine. My grandmother and I used to sit in front of the big picture window that looked out on the sea and watch the marine traffic passing by. There were lots of tug boats pulling barge loads of lumber south to a growing California in those days….this would have been in the early 1950’s before there were freeways for moving those big loads of lumber. I was always fascinated by these slow moving craft with their running lights on in the night. I didn’t make it onto a tugboat, or any other boat for that matter until quite a few years later, but there was always something about those images of the far off ships and tugboats that seemed adventurous, wild and engaging. The obsession with small boats, and now wooden paddle and surfboards, started in our family garage where my Dad and brothers and I built a small wooden sailboat. We learned a lot and got a fun toy out of the “deal”, which we enjoyed for years. Later, after being discharged from the US Army, the building of a boat I could travel on and leading an adventurous lifestyle was a high priority. I built the boat, a very bare bones but strong boat, and had some great adventures for a few years. My own 32’ blue water sailboat solved some of the wanderlust in me. 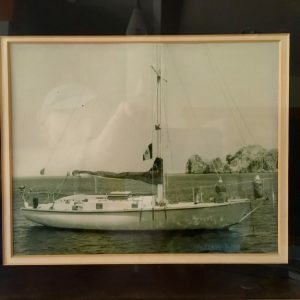 I learned the ways of the sea building and sailing that boat and along with crewing on sailboats in the South Pacific and running my own commercial fishing boat for a couple of seasons I learned much about the sea and life on the waterfront. My attraction to the sea has never waned but life ultimately presents many interesting directions to pursue. Quality built, hand-made products of all types have always been interesting to me. Whether it was the complicated silkscreen prints I made as a college student or the estate level residential construction projects that became my long term career, I have continued to be intrigued by traditional wood watercraft. 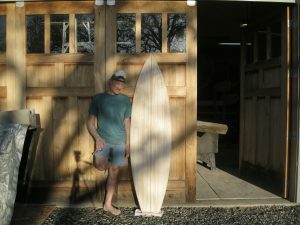 Building and paddling hollow wooden paddleboards and surfboards has taken center stage at this point in my life. The boards are interesting to build, look beautiful and perform great. I look forward to engaging with this process every day. But the most satisfying part of the experience is mentoring other builders. I meet so many interesting and accomplished individuals and get to share my hard won experience and knowledge about watercraft and the art of building them on a daily basis.